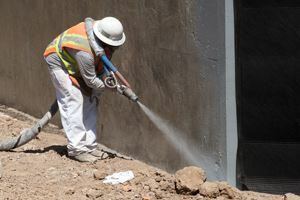 Takeaway: Since the early 1990s, when fast-set polyurea coatings were first introduced, the industry debate about these coatings, hybrids and polyurethane spray systems has raged. In the decade that I've been working with polyurea spray coating technologies, plus four additional years on the polyurethane chemistry side, we have come a long way in our understanding of the advantages and disadvantages of each chemistry. In today's industrial environment, downtime for any process can be very expensive. An example is the oil and gas market where fast-set spray systems are used to create secondary containment for well sites. On jobs sites like this, it may cost owners more than $100,000 per day for coating project downtime. But, with the U.S. Environmental Protection Agency (EPA) monitoring these sites closely, such secondary containment projects are essential. Current changes in the industry have helped polyurea technologies get past some of the perceived disadvantages, such as poor adhesion, limited raw material availability and difficult processing characteristics. Probably the most important change has been the increasing number of raw materials available for formulation work. When polyureas were first developed, there was no question that fast reactivity was a problem. Now with secondary diamines available, the chemist has the ability to "tune" the reactivity of a system with longer gel times. A less popular method of slowing down pure polyurea systems is the addition of high 2,4 MDI prepolymers. By using steric hindrance provided by the 2,4 position of the free NCO, a formulator can slow down the gel time of pure systems, often leading to higher substrate adhesion and improved physical properties. By incorporating these new raw materials, pure polyureas can be slowed down to overcome "wetting" problems that can lead to poor adhesion. A lot of work has been done to understand more about proper surface preparation for all spray technologies and how to write these into a good specification. Unfortunately, early generation polyureas were at the center of a lot of coating failures. One famous failure, the San Mateo Bridge in the San Francisco Bay Area, has been the subject of many articles over the years. I have followed the history of this job and talked to those who were involved in the failure analysis. It should be noted that a great deal of this job was a success. At that time, fast set, unlimited film build and zero VOCs were advantageous features that drew many inexperienced suppliers and applicators into the polyurea game, which in turn thrust specifiers into uncharted territory. Key problems in this famous failure included improperly specified surface preparation, and how the specifications addressed changes in job conditions from day to day. Now, through the hard work of groups including the Polyurea Development Association (PDA) and SSPC, standards and specifications are being introduced to help set guidelines for proper surface preparation for polyurea systems. As a result, proper techniques for installation of polyurea coating systems are now more widely known across the industry. Although a lot of blame was placed on formulators and applicators for early polyurea job failures, equipment was definitely part of the equation. Early machines had limited pressure build and poor heating control that often left applicators processing outside the parameters set by formulators. New pumping systems have made the application process easier and more precise. Equipment manufacturers have added quality control features that prompt the applicator when there is a mix ratio problem—an issue that may have gone unnoticed in the past. With advancements in raw materials, surface preparation methods and spray equipment, the failure rate for polyureas is on the decline, and the use of polyureas is on the rise. As the industry learns the "do's and don'ts" of choosing the proper system and chemistry for the job, the specifying world is now putting confidence back into polyureas. The simple truth about pure polyurea is that when this fast-set chemistry is formulated, specified and dispensed properly, it can add significant value to many industrial applications. Polyurea chemistry can help reduce unintended reactions with the environment, either natural or manmade, and create a high-value solution for many corrosion and waterproofing applications. Written by Kyle Flanagan, B.S. Past President of the Polyurea Development Association (PDA), Kyle Flanagan is a coatings and polyurea chemist and entrepreneur based in California. After receiving his BS in environmental chemistry from the University of Houston at Clear Lake, Texas, he began his career with The Dow Chemical Company, serving eight years in the Polyurethanes Research & Development and Polyurethane Systems House.